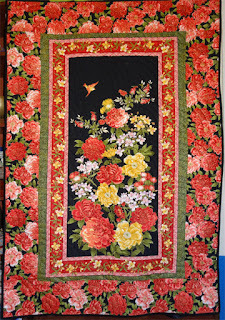 I Quilt, Therefore I Am: Quilt 40: Chinese Peonies - DONE! 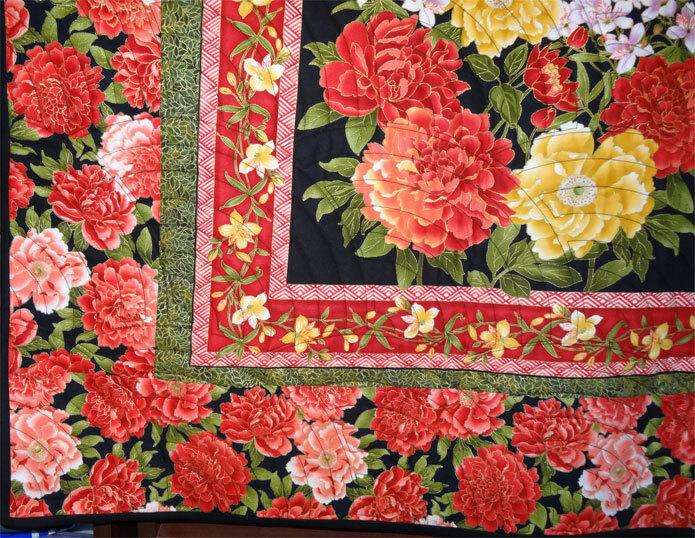 Quilt 40: Chinese Peonies - DONE! It sat in my closet for almost 3 years - this kit from Florida. But I've finally put it together. I have to laugh - this was probably the FASTEST quilt I ever did. And here's a closeup. It's a shame the colours in the photos don't come through true - it looks a bit "tomato-y" here. But in real life, they are rich, deep and vibrant. 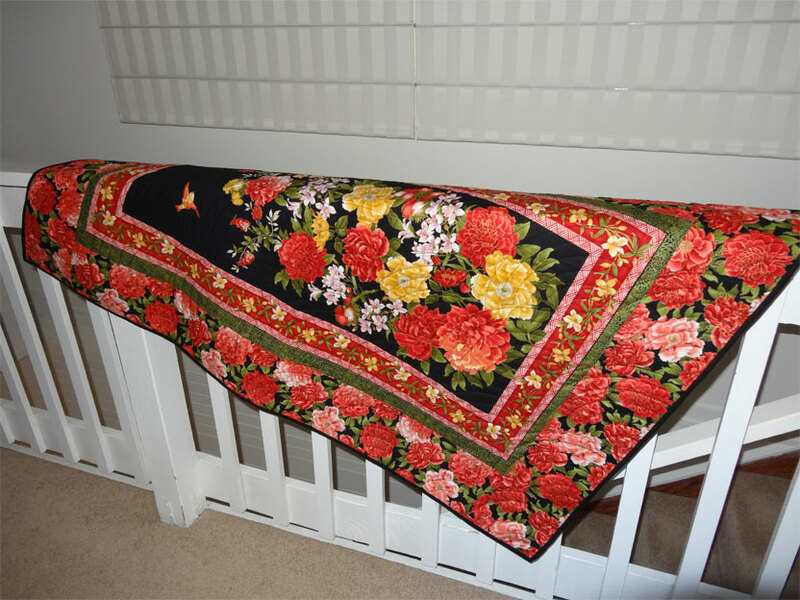 In years past, I posed all my quilts on the stairwell rail. I stopped doing that - but hmmm... may start doing that again - as it does make a nice place to "pose". It took about 3 hours to finish the quilting. I'm still amazed at how fast this longarm is - and the Baptist Fan pattern, with all it's uninterrupted lines, goes by very fast. As I'm going along, I'm doing better with the longarm. I've become quite adept at dealing with it when the bobbin thread runs out. You can barely tell now where that's happened, and I'm happy with that. 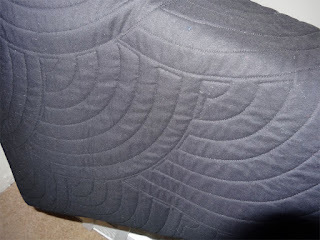 Dealing with the top thread breaking is still a challenge, but thankfully the thread I'm using ("Signature" brand) - as recommended by Howard the longarm dealer - has been great - it rarely breaks. 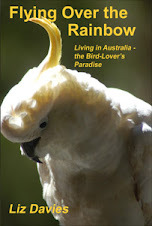 Even so - it does happen occasionally, so I'm gradually learning to cope. 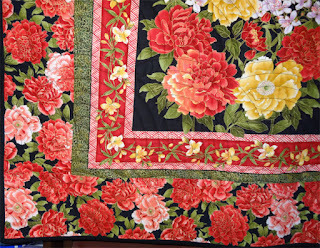 And dear friend Ebony now has her Chinese quilt - Oh... you should have seen the look on her face when I gave it to her. That look of joy was worth every stitch. Quilt 29: Green and Purple jelly roll - DONE! Quilt 38: Baby Animal Quilt - DONE! Seeing Red Again - But Now a Solution! Quilt 39: Beatrix Potter quilt - DONE! Quilt 33: Royal Peacocks - DONE!